Namaste! Let's continue this week's food theme with a pallet inspired by some of our favorite cuisine. Tikka Masala, Palak Paneer, Curry, Tandoori anything.. we just can't get enough ethnic foods and Indian is one of our favorites! With it's rich red, deep gold, & earthy green spices, Indian food is by far the most colorful and vibrant of them all! We love the way these savory hues play off each other and work together to create a color scheme that invokes comfort, warmth, & passion. 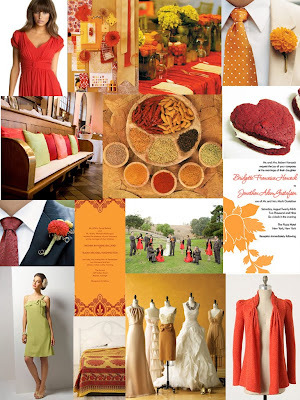 This is one delectable color inspiration that we're sure will add a little spice to your home, event, or Fall wardrobe.